Backcountry Riding Update The most popular sleds for riders to buy today are backcountry/mountain/crossover sleds. These sleds were designed for riding out west in deeper snow, but they have become very popular to eastern riders to buy and ride also. One issue for these sleds is that the taller paddle tracks have some difficulty cooling the motor on hard-packed or icy trails. As such, many of the riders on these sleds look to get off of the designated trail and into some loose snow to cool the motor. This has led to landowners threatening to close trails because riders are not staying on the trail that was established many years ago. One of the most popular places to try to get a “back country” experience is north of Rte. 26 in Coos County. The Connecticut Lakes Headwaters has several areas that are ideal for this style of riding and a group has formed to try to get some areas open to this “off-trail” riding. The Bureau met with several landowners to discuss this concept and a few things came up that no one had thought about in previous discussions. The Connecticut Lakes Headwaters cannot be opened for off-trail riding in any locations. The landowner of the property does not have the right to allow this use. In 2001 the State of NH purchased a conservation easement on the property. The road network became property of the State and a vast network of “designated snowmobile trails” was documented and included in the easement. 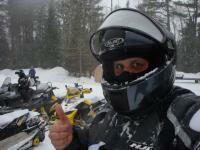 Snowmobiling is the most protected recreational activity on the property. However, in 2001, the idea of having legal riding off-trail was not even a consideration and the easement was written to specifically protect the long-standing tradition of riding on trails only. Even the landowner of the property does not have the rights to give written permission for riders to go off trail. It is important to note that the landowner has asked law enforcement officials to stop all off-trail riding on this property. The Bureau also met with several other large landowners in the North Country to see what their thoughts were on designating some free-riding areas on their properties. There is some general support for this in the future, but we still have to work out a few things: how do we define the boundaries (likely will find an area that has trails on all sides and highlight the area within those trails); and does the Bureau’s landowner liability Insurance policy still protect the landowner for this activity? The insurance policy has always been written to protect landowners for use of a designated trail, not for riding anywhere on the property without boundaries. This question is still out to our insurance provider to try to get an answer back. In summary, it is not legal to ride a snowmobile off of a designated trail in NH unless the rider has written permission from the landowner. And most landowners are not going to give that permission at this time. Technology moves faster than policy and tradition. We are continuing to work on this, but no guarantee we will have any solutions for this season. Bummer I didn't see ya! Got a late start, but still managed get in a 104 miles today. Welcome Chris, and thank you! Brake disk is on that side too isn't it? 134 or so miles with Nox, Coldbrew, and 6 others. Left from Wellington state park and headed north....Hardy Country in the morning was the best I’ve ever seen it.....warren to Haverhill started out nice, but went quickly down hill, trails and fields were bare and icy....just not enough snow that way. We ate lunch and headed back to warren and over to Campton and back south to Plymouth and back to Newfound lake. Hardy Country was still great on our way back through at 4pm. Got the fleet out for a family picture today. I was at my parents yesterday and she says I saw an old yellow snowmobile just like my old one go by the other day...I and said Hey, I know that guy! True, But at least a registered snowmobiler contributes to the search and rescue fund. I only rode two miles in circles at my parents house, but I got to watch this....Life is good. Anyone using a vintage plate? How/where did you mount it? I certainly don’t want to drill any holes in the hood. I’m thinking I’ll drill the snow flap and use some stainless steel hardware to mount it there.